Flowers are the perfect gift for Valentine's Day! 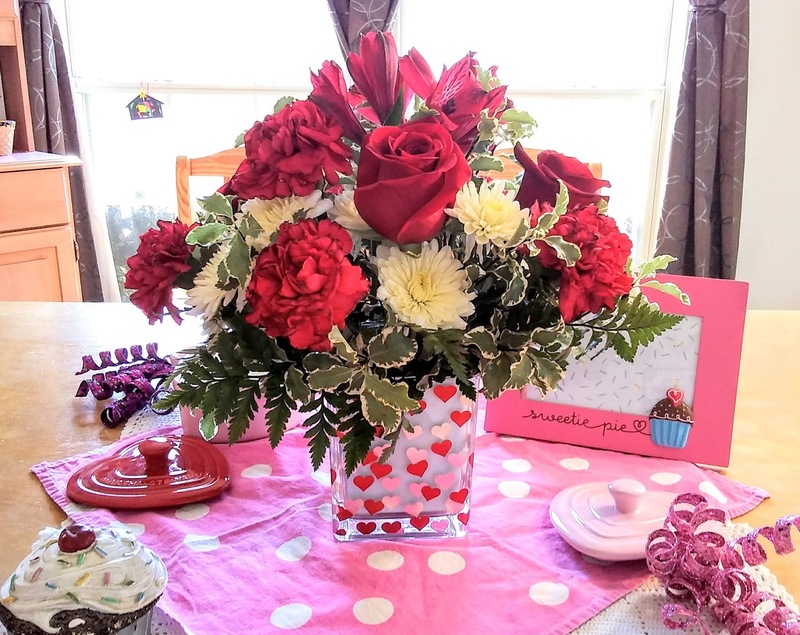 I received a floral gift from Teleflora to facilitate this post. Looking for the perfect gift for Valentine's Day? I think a pretty bouquet of red roses and white mums in a gorgeous glass cube that dances with red and silver hearts says "I love you" in the best way. When you choose beautiful flowers for a girl that you love, you don't have to worry about things like size or spoiling her diet. You don't have to worry about food allergies like a dairy allergy either. If you deliver the flowers to her workplace, you will look a knight in shining armor as she makes all the other girls so jealous. Your special girl will be smiling all day as she gazes at her pretty flowers and smells their wonderful floral aroma. That special arrangement of hand-picked flowers will be the start of happy together. So celebrate your love and affection to the one you love, whether that be your wife or your girlfriend. 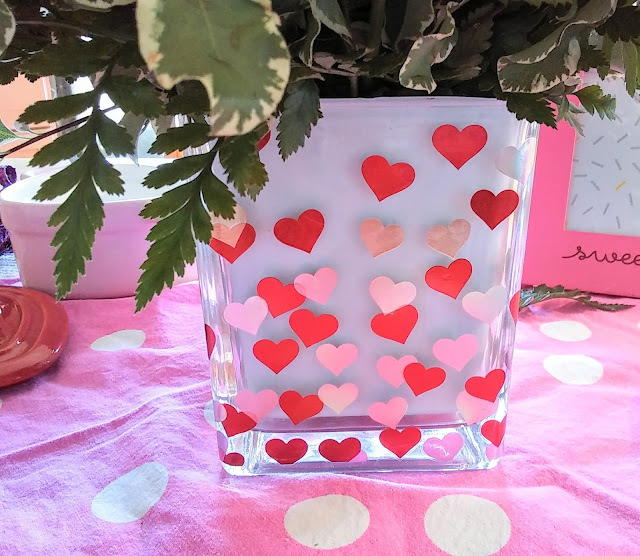 A gorgeous glass cube that dances with red and silver hearts says "I love you"
I do love receiving flowers for Valentine's Day from my husband. 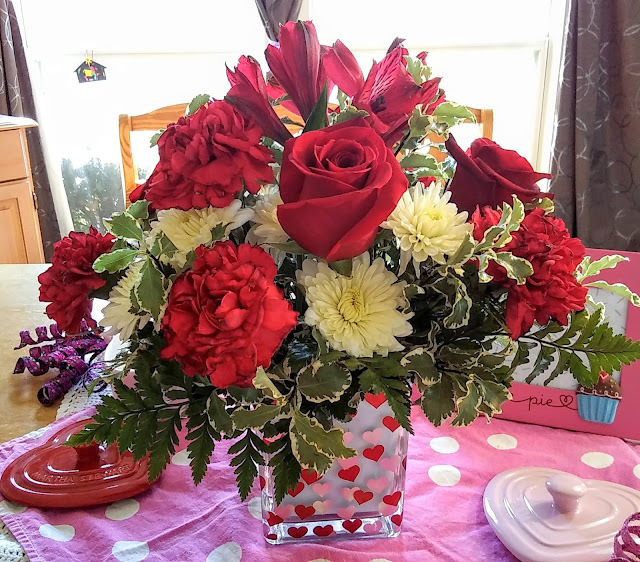 From the moment the doorbell rings and I see the bouquet of red roses that is decorated with other pretty flowers to several days later when I am admiring my flowers, I know that my husband loves me. I know that my husband put thought into this special day as he took the time to order the flowers several days before Valentine's Day. Unlike those guys who are last minute shopping at the grocery store on the eve of Valentine's Day. I find it quite amusing that most grocery stores have a special line for all the last minute men shoppers. I always avoid any stores on Valentine's Day as they can be quite crowded with people who are buying Valentine's day gifts. that I enjoy and I have only found it at one store in town. It is also hard to find at the store so I can't chance my husband buying chocolate anymore and I give him hints to buy me flowers. My husband used to buy me the best chocolate for Valentine's Day and hide them all over the house. He would give me a heart-shaped box and inside that empty box would be a clue to help me find a piece of chocolate. Each piece that I found would have a clue to lead me to the next piece of chocolate. I love how much though my husband put into my gift. 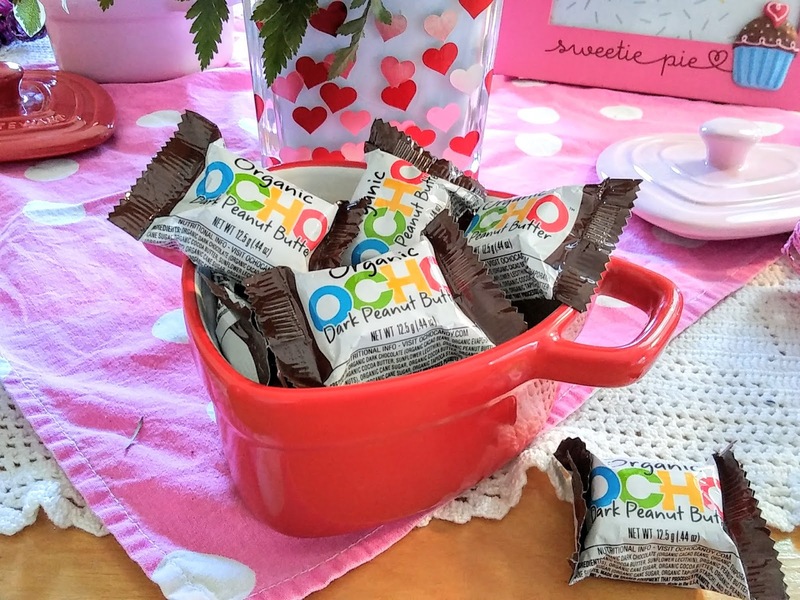 The way that I show my love to my husband on Valentine's Day is through making him a sweet treat. My husband loves these Chocolate Mint Mousse Brownies and they are so easy to make. This indulgent chocolate dessert is a perfect dessert for our Valentine's Day dinner. I also make a dairy-free dessert so we can delight our sweet tooth together. 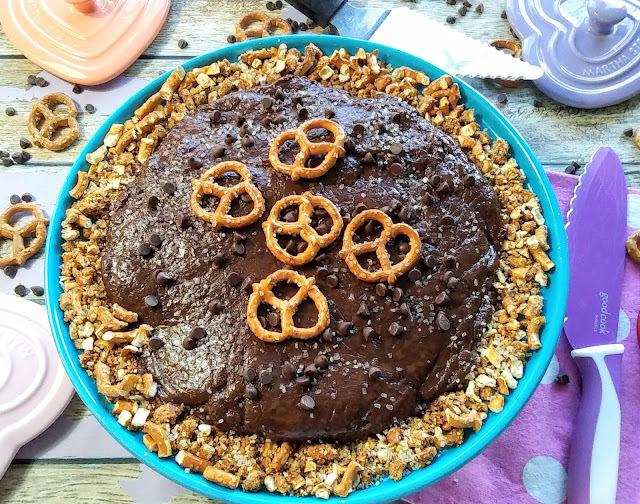 I made this dairy-free Chocolate Pretzel Pie last Christmas and my family loved it. I barely got more than a slice of the pie. So maybe with me making two desserts, I will get to enjoy more than one slice of the pie. Long after the flowers have wilted, I will still enjoy my Valentine's Day gift. I will use the beautiful vase dances with red and silver hearts to store things like candy, pens, make-up, or other small items. I think this special vase will look good in my kitchen, right next to my pink Kitchenaid stand mixer that I got for Chrismas last year. Every time that I use my stand mixer, I will remember the special flowers that I received from the man that I love. The best place to buy flowers is at Teleflora. This place has so many fresh flower bouquets that are hand delivered and they come with the most beautiful vases. I just love their selection of hand-picked flowers. It is so easy to order flowers for Valentine's Day online. Oh my goodness those flowers are absolutely stunning and those puddings oh I just want to tuck in! I'm going to have to check out your recipes. I love flowers so much and those ones are gorgeous! 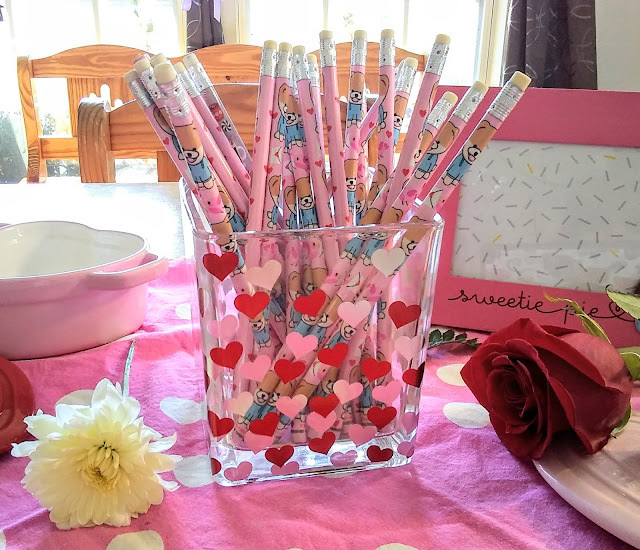 The vase is so cute too and not over the top like a lot of Valentines things can be. Your Valentine's has started indeed! Yes , I love flowers but even more...chocolates! Your dessert is just so yummy. I'll need chocolate for Valentine's! It looks wonderful. I still like chocolate for Valetine's Day too. I always thought I was one of the only ones. Pretzel pie?! OMG! I need to try this right away. It looks and sounds delicious. My husband and I are celebrating Valentine's in March this year. I like getting roses but since I had the transplant, we have backed off on that. 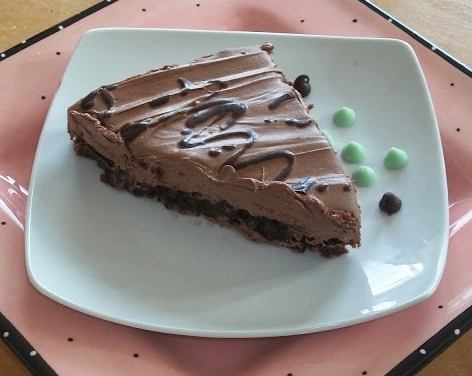 I love chocolate and pretzels together so this pie looks tempting as does the mint mousse brownies! I just love that Chocolate Pretzel Pie!! I definitely need to try that one. Those mums set right in with the red roses makes for such a beautiful display!! I love how you can use the vase to hold other things afterwards, because it is adorable! The dairy-free cake looks delicious and I hope that you will get to enjoy some more this year! I love flowers and chocolate, these are really cute. I need to try your diary free cake that sounds delicious. Valentines Day is an amazing and beautiful day! That stuff is so so perfect gifts ideas for coming Valentines! I absolutely in love with those flowers! These are some amazing gift ideas for valentines day!I love getting flowers on that day from my sweet heart.